kid friendly | Dinner Love. I’ve begun to really appreciate pizza as a delicious way to use up veggies and meats that you otherwise might not think to use together. When in doubt, put it on a pizza! Tasty. 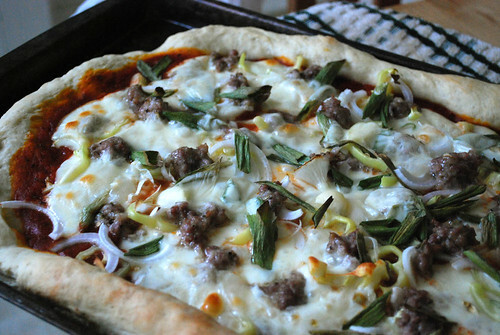 Pizza is also an amazing dish to make with kids. My Mom used to make pizza with my siblings and I when we were young, and I remember thinking that it was so much fun to be able to choose your own toppings! The best was that we never fought about it. We were actually encouraged to split pizzas in half and slather that pizza with whatever we wanted. Homemade pizza nights were always the best! I get a CSA box every two weeks, and this week’s box has fresh spring onion, gypsy peppers, heritage tomatoes, lettuce, strawberries, apples, and rosemary. 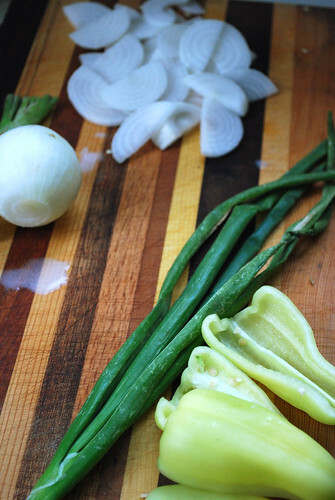 I took one look at the onions, which still had the green bits attached, and knew they belonged on a pizza. I made the pizza dough and the sauce from scratch, but toppings were chopped and topped. As most toppings are! I am extremely pleased with the dough recipe that I used. 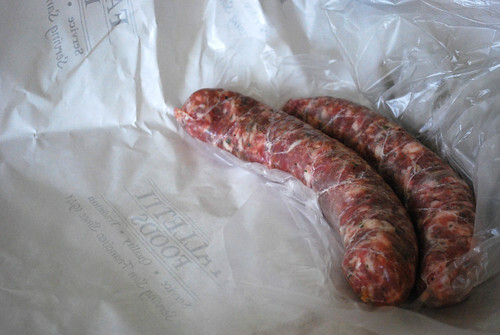 It is very easy to handle and roll out, yet pleasingly crispy. It also has a short rise time. Totally recommended for all of your pizza dough needs! First make the dough. You’ll need to allow it to rise, which will take 1-2 hours. Mix the warm water and the yeast and allow the yeast to dissolve, approximately 5 minutes. 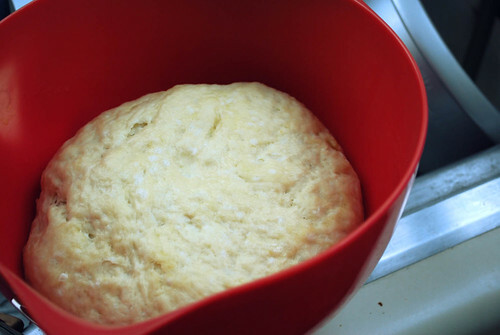 Mix together the flour, honey and salt, then drizzle in the olive oil and the water-yeast mixture. Stir together all the ingredients until the dough forms a ball. Turn onto a floured surface and knead until smooth, adding flour if the dough is very sticky. 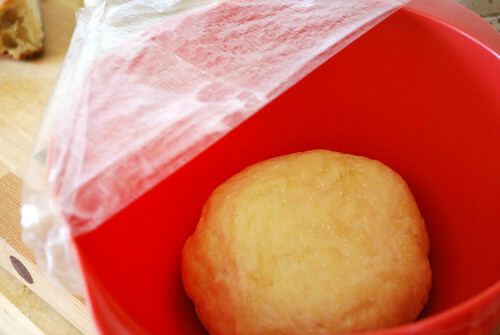 Put the ball of dough into an oiled bowl, cover with plastic wrap and allow to rise for an hour. I allowed mine to rise for 2. I love poking bread dough after it has risen. It satisfies the same libidinal urge that stomping on bubble wrap does! When you’re ready, roll out the dough, starting from the center and working your way out. Don’t roll over the edges; this will leave a nice crust. This dough can be rolled very thin without breaking or tearing, which is awesome. 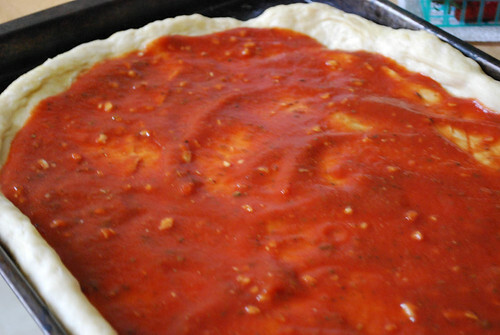 After the dough has risen, before you roll it out, make the tomato sauce. 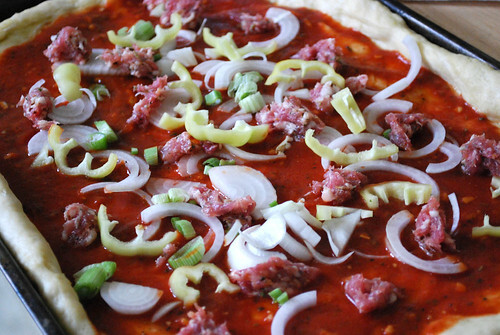 Mix all ingredients together and allow to simmer for as long as it takes you to roll out the crust, 5-10 minutes. Put the rolled out dough onto a baking sheet and smooth the sauce onto it. The best way to do this is the back of a metal spoon. Now you get together your pizza toppings! Put about half of the toppings sans cheese onto the crust. 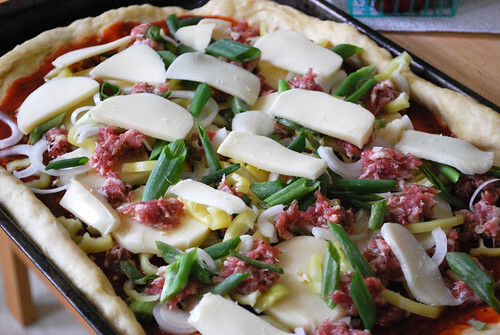 Cut the mozzarella into slices and layer half of the cheese onto the first half of the toppings. Then layer more toppings and cheese, ending with cheese. Allow to rest for 10 minutes, then cut and devour!